You are here: Coaching Leaders > What Is Emotional Intelligence? “Intelligence quotient” (IQ) tests were designed early in the 20th Century to measure cognitive ability and intellect, which are still widely believed to be the whole story on intelligence. The school system all over the world was geared to valuing and developing these capacities. Other important capabilities, such as the ability to get on with other people, were largely ignored. In the early 1980’s, some psychologists began to question the claims of IQ to be the only relevant model of intelligence. as well as the logical-mathematical and linguistic capabilities traditionally thought of as intelligence. Gardner’s ideas began to explain why IQ on its own was not a reliable predictor of success in most areas of life, and were enthusiastically adopted by many educationalists. The “intrapersonal” and “interpersonal” intelligences together can also be described as emotional intelligence. “…generally optimistic, flexible and realistic and are fairly successful in solving problems and coping with stress without losing control.” (quoted in Childre and Martin, The HeartMath Solution). These categories were popularised by Daniel Goleman in the bestselling books Emotional Intelligence and Working with Emotional Intelligence. Goleman argues that the competencies of emotional intelligence are at least as important as traditional IQ in determining success in work and life. Since these books came out, many other books on emotional intelligence have appeared, each seeking to redefine the concept of emotional intelligence in terms of previously existing approaches in psychology or therapy. And each consultancy that markets a psychometric test claiming to measure emotional intelligence has had to come up with a new, slightly redefined model of what EQ is. NB in this model ‘Motivation’ is now part of ‘Self-Management’. 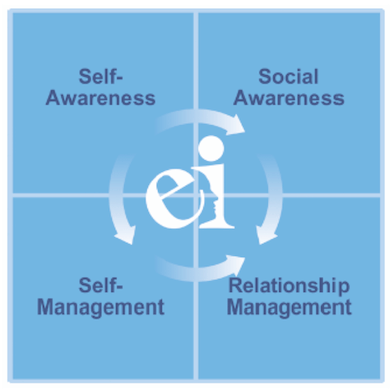 Is it possible to find out about using your Emotional Intelligence Test with others? Your site was referred to me. Thank you so much! Thanks for your question about this that you posted on my Emotional Intelligence page, and apologies for not replying sooner. I should tell you that due to the uncertainty which still surrounds the incoming European Union changes to Value Added Tax rules due to be implemented on 1 January, I may well be taking all of my products off the market for a while on that date until the rules become clearer – so you may want to make your purchase before that date! Found this really useful as a people manager. One of the biggest motivators for me (and for most people) is to hear and see that my work is making a positive difference for people, so I really appreciate this feedback.